Gianna della Luna may seem to have been a little quieter lately, but that’s far from the truth .. what’s that they say about swans serenely travelling across the water, but paddling like mad underneath? We’re actually on the verge of completing the writing of our third title since June 2014, although the books in question are going down different routes. We’re delighted to report that our latest – started in December – is nearing completion. It has been held up slightly by pressure of other work and family issues, but it is now coming on apace. It will soon be going through revision and polishing, with a definite channel in mind – which won’t be our own publishing channel. 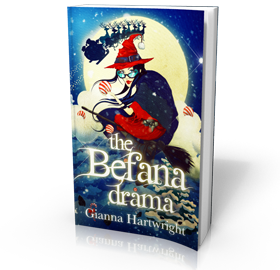 The same is true for the two titles that preceded it – which followed hot on the heels of Befana Drama 1 & 2. 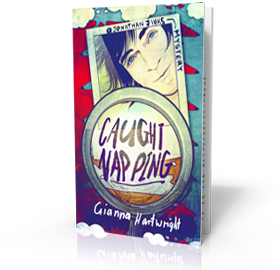 The latest book is targeted at children aged around 10 years and is a delight to me, as the author, as it weaves in some of the things that I know both boys and girls have loved about my creative writing workshops. It is very much targeted at boys and ladette girls, written in a humorous and slightly irreverent style throughout and full of high-adrenaline action. Whilst we can ‘t give too much away, it is set in London and features fabulous non-human characters – who are all on a mission and a very big one at that. Whilst it is fictional, it draws upon fact as the theme behind the story line, which is what makes it very exciting. It has larger-than-life characters and an appeal that is most definitely not niche, even though the setting is London. It also gets me off the hook, as a historian – at last I’m doing something with my degree and actually even manage to weave in a bit of my one-year PhD studies! During the writing of this book, as with all titles, we’ve been thinking ‘trilogy’ – a tip imparted by my dear friend, Abdul, at last year’s Bologna! The second book in the series has been pencilled in for quite some time, but the third book’s plot has been determined this weekend. As a trio, I think they’d work brilliantly. News headlines have also confirmed that the plots are the way to go. Two decisive meetings were held at Bologna, which have really helped shave the current book in the 10 -12 days in between. In fact, I left one meeting, went back to my hotel room and cracked on with changing things to suit the advice given! That was a late night! The writing has been phenomenal since then, having sounded out those in the know and found the talent to help make things zing and inspire. We have also managed to tie up ways of incorporating another artist into the camp, working with our talented team in South Africa, should we decide to do something different with the book written last June and, in fact, the one written in October. That is, again, very exciting, as it could break a mould in terms of book promotion. We could also soon be seeing our first book in Italian translation! Focusing on the market has been one of the real advantages of attending international book fairs. However, the next book that will be written (and one has to say one is itching to get going on this) has been shaped by a completely different set of events. 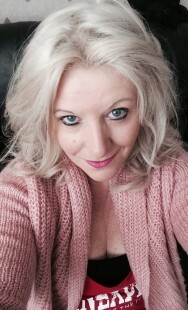 While the current one (title secret) is for the boys, the next will be very much for the girls – moving on a writing spectrum from David Walliams to Jacqueline Wilson. In my PR career, I’ve always urged students, trainees and employees, to create an avatar of the target customer in their heads. The current book and the next one both have an avatar of a particular child I’ve met during creative writing courses. Every time I finish a chapter, I’m thinking ‘what would x think of that?’ That’s what makes it so exciting. The whole book schedule has been re-jigged since Bologna, thanks to meetings, agents’ demands and time factors. Sooner or later, I think the half-finished book, started immediately after last year’s Bologna, needs to be hauled out and finished, as it has great potential in a completely different age group – young adult. It just got overtaken by events, more pressing deadlines and the need to write to order. With finances now not an issue, the world is our oyster. In the meantime, we still have Rogue Elephants generating sales in the USA, in particular. 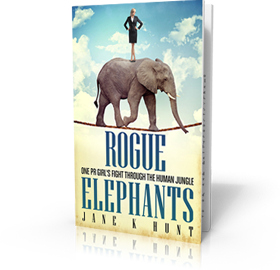 As a few Rogue Elephants have come my way since book 1, maybe there will, one day, be a second volume. If so, it will be focused on people who didn’t realise what they could have had, as well as those who were just plain fools, generators of moments of high humour, or nasty individuals, up to no good. Since writing book 1, I’ve been told that one of the people I tackled head-on is someone who heavyweight boxers shouldn’t take on lightly, organising many a racket and much worse! I do think that’s part of life living on the Fylde Coast … perhaps I need to uproot and go to where the heart feels happier and the book production can be a never-ending process. All I need is someone to pay the bulk of the bills and the rest could be glorious! I don’t need a palace, I just need more time. If I actually had any of that, I’d be turning out at least 10 books a year! Watch out for the new titles. I feel the current book is the best yet and the next one – because of its focus on girls – could be even bigger. Sooner or later, I’ll do what I always intended to do as a writer – writing crime mysteries for adults! Life is what happens when you’re busy making other plans. It just happens slowly in publishing and, particularly, when you’re a mum with a full-time job and one’s own business!